Pyongyang, March 28 (KCNA) -- Kim Jong Un, chairman of the Workers' Party of Korea and chairman of the State Affairs Commission of the Democratic People's Republic of Korea, paid an unofficial visit to China from March 25 to 28 at the invitation of Xi Jinping, general secretary of the Central Committee of the Communist Party of China, president of the People's Republic of China and chairman of the Central Military Commission. He looked round the exhibits, being briefed on the successes made in the field of natural science and technology such as nuclear physics, space technology, agriculture and energy. Pyongyang, March 28 (KCNA) -- General Secretary Xi Jinping made a speech at a grand banquet arranged in welcome of the China visit by respected Supreme Leader Kim Jong Un. He said that the visit by Chairman Kim Jong Un is the one of great significance at a special time, and it suffices to prove that Chairman Kim Jong Un and the Central Committee of the Workers' Party of Korea attach utmost importance to the relations between the two parties and two countries of China and the DPRK. It is also of weighty significance in deepening the communication between the two sides, strengthening cooperation and promoting partnership, he added. He said the visit would make an important contribution to putting the relations between the two parties and two countries on a new stage and promoting the regional peace, stability and development at a new historical time. The traditional Sino-DPRK friendship was personally provided and cultivated with much effort by the leaders of elder generations of the two parties and two countries, he said. He noted that President Kim Il Sung visited China over 40 times in his lifetime, forging deep friendly feelings with the Chinese leaders of elder generation including Chairman Mao Zedong and Premier Zhou Enlai. 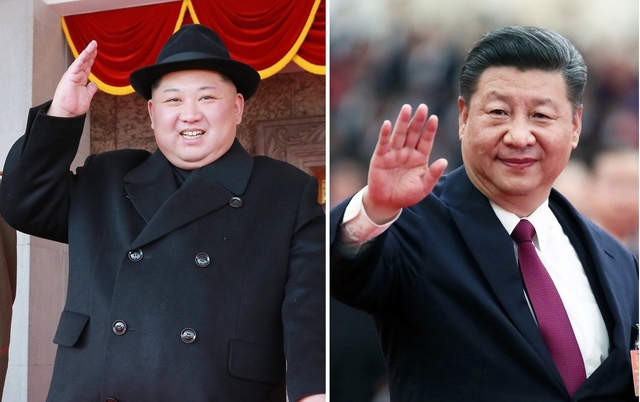 The traditional Sino-DPRK friendship is the unique one in the world that has been sealed in blood, and it provides the two parties and two peoples with happiness just as a luxuriant tree with deep roots and a never-drying spring, he pointed out. When General Secretary Kim Jong Il visited China in May 2010, he said that the DPRK-China friendship is a heritage provided and bequeathed down to us by the revolutionaries of elder generation and that it is our historic and strategic option and unshakable stand to value it generation after generation, Xi Jinping said. He said he had talks with Kim Jong Un in a friendly atmosphere. We are convinced that no matter how the international and regional situations may change, both sides would take firm control of the general trend of the world development and the over-all phase of the development of Sino-DPRK relations, strengthen high-level visits, deepen strategic communication, and expand exchanges and cooperation, thereby providing the two countries and peoples with happiness. At present the Chinese party, government and people are striving and struggling to realize the "second one hundred year" goal and the dream of China, i.e. great prosperity of the Chinese nation, under the strategic assignments set forth by the 19th Congress of the Communist Party of China. Xi Jinping, said that the diligent and resourceful Korean people are making redoubled efforts to build a socialist economic power under the leadership of the Workers' Party of Korea headed by Chairman Kim Jong Un. Pyongyang, March 28 (KCNA) -- Xi Jinping, general secretary of the Central Committee of the Communist Party of China, president of the People's Republic of China and chairman of the Central Military Commission, hosted a grand banquet in welcome of the China visit by Kim Jong Un, chairman of the Workers' Party of Korea and chairman of the State Affairs Commission of the Democratic People's Republic of Korea, at the Great Hall of the People on March 26. Kim Jong Un and his wife Ri Sol Ju entered the banquet hall, guided by Xi Jinping and his wife Peng Liyuan. All the participants in the banquet warmly welcomed the supreme leaders of the two parties and two countries. Prior to the banquet, they watched a video on the activities of the leaders of the two parties and two countries who provided and nurtured the roots of the DPRK-China friendship. The viewers were impressed by scenes showing the lifetime of the leaders of the elder generation including President Kim Il Sung, leader Kim Jong Il and Comrades Mao Zedong, Zhou Enlai, Deng Xiaoping, Jiang Zemin, Hu Jintao and Xi Zhongxun. The banquet proceeded in a comradely, fraternal and amicable atmosphere. At the banquet there was an art performance specially prepared by Chinese artistes to welcome Kim Jong Un's China visit. 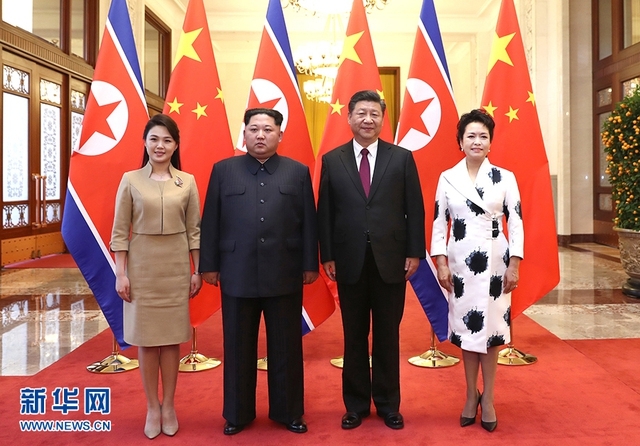 Kim Jong Un and his wife Ri Sol Ju conveyed a floral basket to the performers who showed hospitality through the excellent performance and mounted the stage together with Xi Jinping and his wife Peng Liyuan to have a souvenir picture taken with them. Present at the banquet on invitation were Choe Ryong Hae, member of the Presidium of the Political Bureau of the Central Committee of the WPK, vice-chairman of the DPRK State Affairs Commission and vice-chairman of the WPK Central Committee; Pak Kwang Ho, Ri Su Yong and Kim Yong Chol, members of the Political Bureau of the WPK Central Committee and vice-chairmen of the WPK Central Committee; Foreign Minister Ri Yong Ho, member of the Political Bureau of the WPK Central Committee; and other officials accompanying Kim Jong Un and suite members. Ji Jae Ryong, DPRK ambassador to China, and his embassy officials were also invited.